Coverage: Live on BBC Radio Wales, Radio 5 live, BBC Radio Cymru, the BBC Sport app, Connected TV, and live text commentary on the BBC Sport website. Highlights on BBC Two at 19:00 BST. Wales head coach Warren Gatland believes beating England at Twickenham on Sunday would "send a message" to New Zealand ahead of their summer tour. Wales play three Tests against the world champion All Blacks in June. 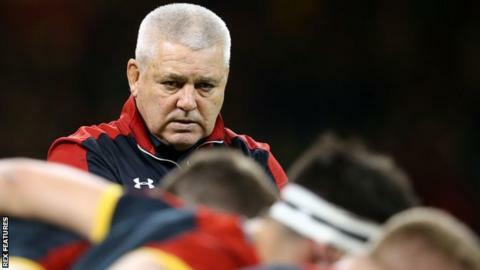 Before that, they face Six Nations winners England, who Gatland thinks are suffering from "demons" following their 2015 World Cup defeat against Wales. "There's no way we want to undervalue how important it is when Wales play England," said the New Zealander. "To arrive in New Zealand, winning, will hopefully send just a little bit of a message. People in New Zealand are pretty excited about the tour." Wales will be without centre Jonathan Davies and lock Luke Charteris, who will be playing for their French clubs in the Top 14 play-offs this weekend and will fly to New Zealand at a later date to rejoin their international team-mates. England, meanwhile, will be shorn of their Saracens and Exeter players, who will do battle in Saturday's English Premiership play-off final. Gatland dismissed the notion Sunday's game would be undermined because of those absentees. "Because it's not the pressure and the hype of the Six Nations, I think both of us will go out there and try and be positive and play some rugby," he said. "Well over year ago, I spoke to [former England head coach] Stuart Lancaster about a potential game before going on tour. "We felt this would help get us up to speed for what we're going to encounter in the southern hemisphere. "Despite any speculation, it was purely a rugby decision, nothing commercial, nothing about money." England won when the sides last met at Twickenham in the Six Nations in March, surging into a 16-0 half-time lead before surviving a Welsh revival to prevail 25-21. With Wales beating England at the same venue in the World Cup in September, Gatland says Eddie Jones' side were showing signs of psychological after-effects of their earlier defeat. "It was interesting [England full-back] Mike Brown came up to us and said, 'Oh my God, I could see it all happening again'," Gatland added. "There's obviously a few demons in a few of their players if they're still worried about that."